Even though I spent a short time living in Oregon wine country it still feels like one of my homes when I drive through the small town I lived in. All the local spots and fantastic memories flood back. Sometimes I do think about how it would be if I was still living there. I have noticed a few changes and all for the better in my opinion. One being a wine shop. I used to visit a restaurant with a wine bar featuring Ponzi wines quite frequently because I loved the wine bar and the gentleman that managed the bar. He has such a great personality and knowledge about wine. He really made the place worth while and set it apart from the other tasting rooms in the area. Well, he opened his own wine shop/bar and I had to check it out! The shop is slightly off the beaten path but that just makes it all the more better. You walk in and you are immediately surrounded not only by shelves of many different types and regions for wine but wood! Beautiful repurposed old wood floors, original shelving, and this gorgeous wooden bar! The taller bar is made with a piece of wood the owner had been holding on to for a very long time from his grandfather and the smaller bar is actually a younger piece of wood from the same type of tree from the same location as the older piece. Very cool. He has created window benches and seats at both front bay windows where you can sit with your friends and open one of many bottles of wine he offers for purchase. A great way to spend the last bit of the late afternoon before heading off to dinner or back to Portland. The Valley Wine Merchants is definitely rustic, chic, with lots of character and charm. 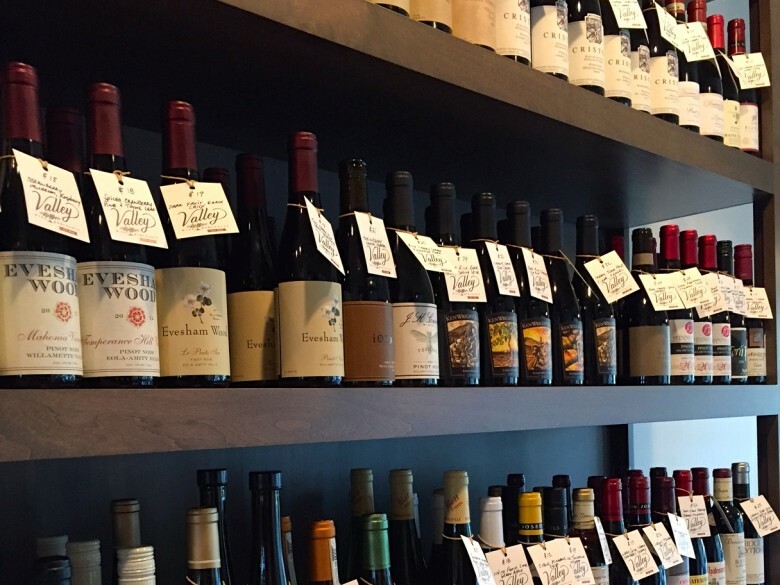 You can find you favorite bottle of Oregon Pinot Noir or go for something from France that you may not find anywhere else. Or perhaps you could ask him for a recommendation and try something new all together! As I entered it took me forever to reach the bar because I had to look at all the wine! Of course I was looking for the smaller boutique wineries I am familiar with from Oregon and also look at the international selection. As I sat at one of the leather bar chairs debating what I wanted to do with my time and money at this great bar I choose to taste a couple wines. I was reluctant to try a white I was really feeling the reds but it was such a hot day in the valley a cool white just sounded about right. A french white was on the tasting menu and I thought, what the hell I’ll give it a shot. I instantly fell in love!!! I sat there for 5 minutes just smelling and soaking up the delicate smells from this wine. Finally I took my first taste and was just blown away. Truly what I expected and hoped for from a beautiful chardonnay from France. 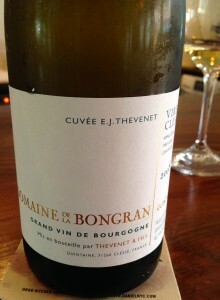 The wine: Domaine De La Bongran Grand Vin De Bourgogne Cuvé 2008. The Field of Bongran is one of the best regions in the Mâconnais for chardonnay grapes. This region produces wonderful chardonnay wine. This label in particular is aged in barrel on lees with light filtration for 20 months before bottling. The grapes also go through malolactic fermentation or second fermentation which can create a buttery creamy texture to the wine. This was so silky smooth. The wine lingered just long enough and seduced you to have more. I truly enjoyed this wine. Great for a summer afternoon or even a fall evening. Andrew is the bar owner and he is great. If you are ever driving through Newberg OR or tasting in the valley around Dundee, stop into the Valley Wine Merchants and enjoy something delicious!